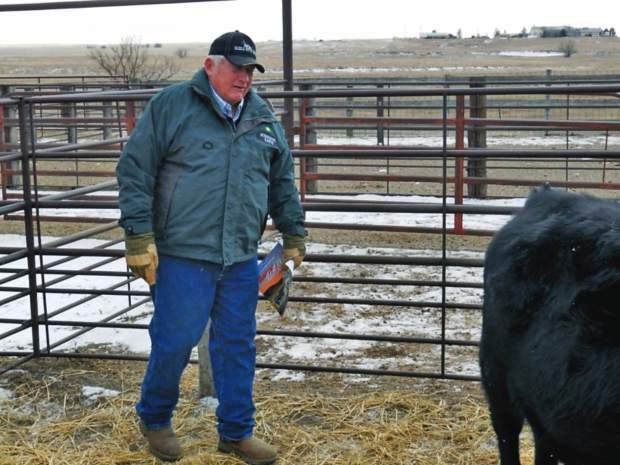 Gerald Burghduff purchased a top bull from the Saddle Butte Ranch. Volume buyer Terry Kline also selected the top-selling bull. The spirits were high and the temperatures low with Travis and Rebecca holding their first annual production sale. The genetic potency of high vigor and endurance that is bred into their bulls has led them from private treaty sales to selling the auction way. 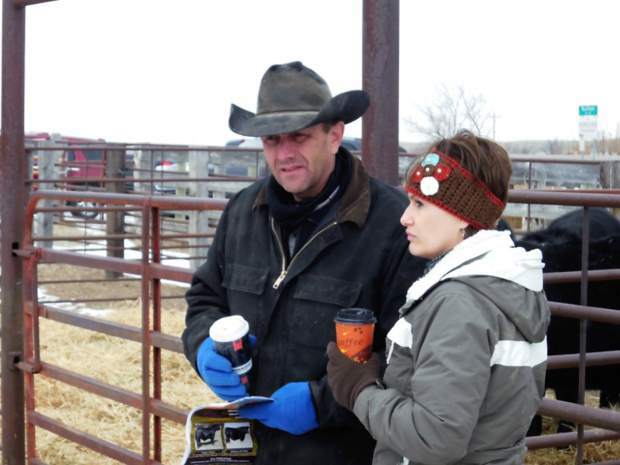 The Smith bulls were by no means a new prospect to the buyers present, as Travis and Rebecca have been selling bulls private treaty from the ranch since 2006. The ranch is about 15 miles northwest of Buffalo where Travis and Rebecca operate alongside Travis' parents, Dave and Paula. The sale was a family affair with a wonderful hot lunch being served by Rebecca's sister, Angela and the auctioneering being done by Rebecca's father, Paul. The top selling bull was split three ways between lots 418, 423, and 424 at $4,600 apiece. All three of these were embryo transfers out of a Bar EXT cow and SS Objective bull. Lot 418 went to Dean and Lori Jenkins of Buffalo, South Dakota. Born at 77 pounds, with an EPD WW of +60, and YW EPD of +103, and Milk EPD of +27. Gerald Burghduff from Camp Crook, South Dakota bought lot 423 at $4,600. This was an exceptionally thick, long calf with an adjusted 205 weight of 718 pounds. He also had a BW EPD +1.2, WW +59, YW +105, and Milk EPD of +24. Also ringing the bell at $4,600 was lot 424, bought by Terry Kline, Faith, South Dakota. Born at 71 pounds, he weaned at 652 and had a Marbling EPD of +.53. Terry was also the high volume buyer, averaging $3,441 on six bulls. Another bull that caught Terry Kline's eye was lot 416, selling to him $4,100. Sired by RITO 9M25, and out of a TC Aberdeen 759 dam. This calf was born at 94 pounds and had an adjusted 205 weight of 697 pounds. John Johnson also of Buffalo, South Dakota bought lot 421 at $3,250. BW EPD +1.7, ADJ 205 wt. 760. WW EPD +63, YW EPD +107, and Milk EPD +28. Call Travis anytime to talk about improving your herd and your bottom dollar with bulls that earn their keep on the ranch.